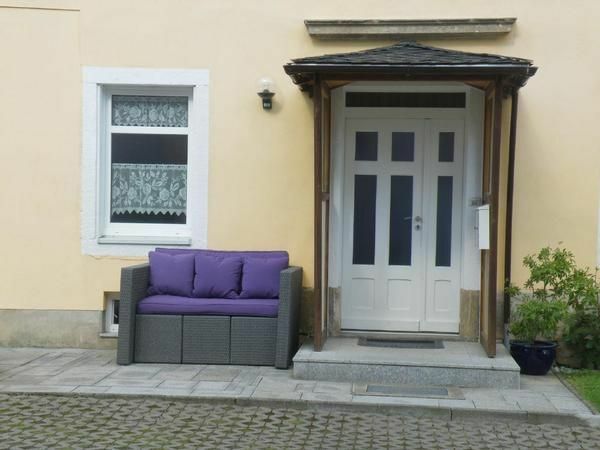 The 2014 newly furnished apartment is located in Lichtenhain on the edge of the Saxon Switzerland National Park. The apartment has a floor space of about 45 m² and is located on the first floor of a former farmhouse where the owner also lives. The ground floor and attic there are more rooms. Access to the apartment and to vacation rooms is via a shared entrance and staircase. The apartment is light, bright and modern, with satellite-TV, Dishwasher and free internet connection. The open kitchen has all the necessary cooking equipment and comfortable sitting area provides enough space for all guests. In the first bedroom has a comfortable double bed (180 cm x 200 cm) and a wardrobe. The second bedroom has a bunk bed (90 cm x 200 cm). The modern bathroom with rain shower is very bright thanks to the large window. With 2400 square the property has plenty of space for playing children. In addition, stands for the guests a barbecue pavilion available. The parking space is located at the house or on the street. From your own mountain, the very good for a picnic is (distance 100 m), a magnificent panorama itself offers Winterberg, Affensteine, Schrammsteine, King and Lilienstein, Unger, and Tanzplan, the volcanic cones in Bohemia and cowshed. Targets in the rear Saxon Switzerland and in Kirnitzschtal can easily be hiked from the house. Until the Lichtenhain waterfall it is three kilometers. Nearest shopping facilities are located approximately four kilometers away. Unseren Kurzurkaub konnten wir hier richtig genießen. Von Lichtenhain aus sind viele Ausflugsziele des Elbsandsteingebirges nicht weit entfernt. Die Vermieter waren immer sehr nett. Die Wohnung war modern und neuwertig eingerichtet. Es war alles da, was wir gebraucht haben. Es hat uns wirkich gut gefallen und wir kommen gerne wieder. The town has three restaurants, a bowling alley, a doctor's office, a football pitch and a children's playground.